We had our annual Maritime Open Day on the 3rd of November 2010 which is a great opportunity for prospective students to have a look at the wonderful maritime facilities we have on offer at the National Maritime College of Ireland (NMCI). This year’s event was a massive success with over 400 students and parents from all over Ireland getting the chance to see our world class facilities. The students were literally blown away with our demonstration on sea survival in our 20m x 8m indoor pool. The students got to see all the pool has to offer, as we showed them what they can expect at sea with our simulation conditions in the pool, these ranged from wind to rain to thunder and lightning and waves. Our Bridge Simulator was a big hit on the day and the students were treated to a simulation trip all the way to Sydney harbor which they thoroughly enjoyed. The students also got to see our sports facilities which included our 16.5m x 31m indoor sports hall and our weights/cardiovascular room. Invited Guest for the day..
We also arranged for shipping companies and other organisations to attend our open day and the students got a chance to meet them and ask any question they had. The eleven organisations/shipping companies that attended the event were Port of Cork, P&O Maritime, F.A.S., Mercy Ships, Nautilus International, SM Bass & Co, B.P, Chiltern Maritime (Trinity), Carnival UK, Princess Cruises and Arklow Shipping. The feedback from the companies was very positive and they were very impressed with the level of interest shown by the students in regards to seafaring careers. 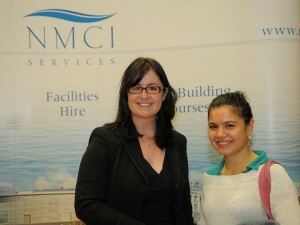 There was also a huge level of enquires in our offshore course here at the NMCI which we are delighted with. The students proudly wore their complementary GTSS caps as they left the NMCI building which rounded off a very enjoyable day for all involved.